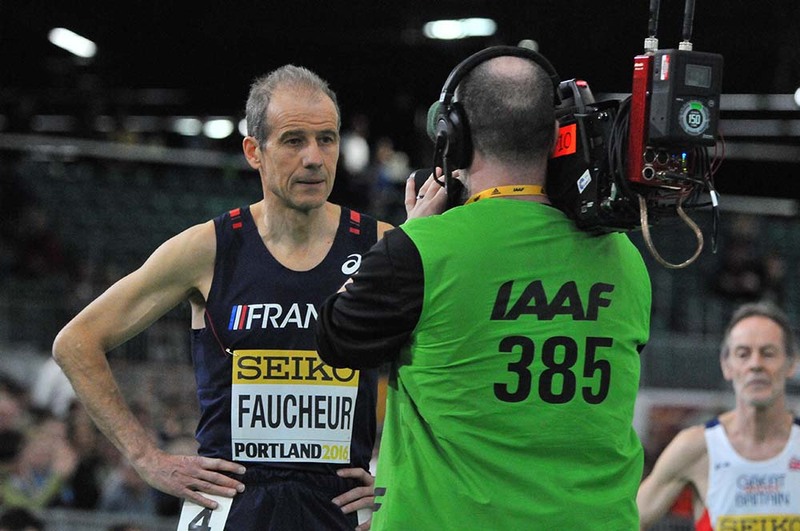 Pierre Faucheur of France took 4th in 2:18.23. Call me crazy, or just plain lazy. I took hundreds of pictures of the masters exhibition 800s at IAAF Portland, and I’m letting anyone have them. No charge. These are original high-resolution images of Saturday’s men’s race won by David Wilcock and the women’s race won by Helene Marie Douay. Plus dozens of before and after shots. Normally, I pick out select pics for distribution to athletes and event organizers. This time, I’m cutting out the middlemen and women. Just grab what you want from my G-Drive. All that I ask is that you credit Ken Stone / masterstrack.com if used publicly. See 219 men’s photos here. And see 86 women’s photos here (I was more discriminating). This is my way of thanking the runners for the great show they put on and showing appreciation to USATF and IAAF for letting me wear a red vest and having access to the track perimeter. All shots were taken with a high-end amateur Nikon D300 body and 80-400mm lens, with ISO set at 3200 and shutter speed about 500. Images are a little grainy, but most are in focus. I look forward to seeing these on Facebook — and the WMA site. Bon appetit. 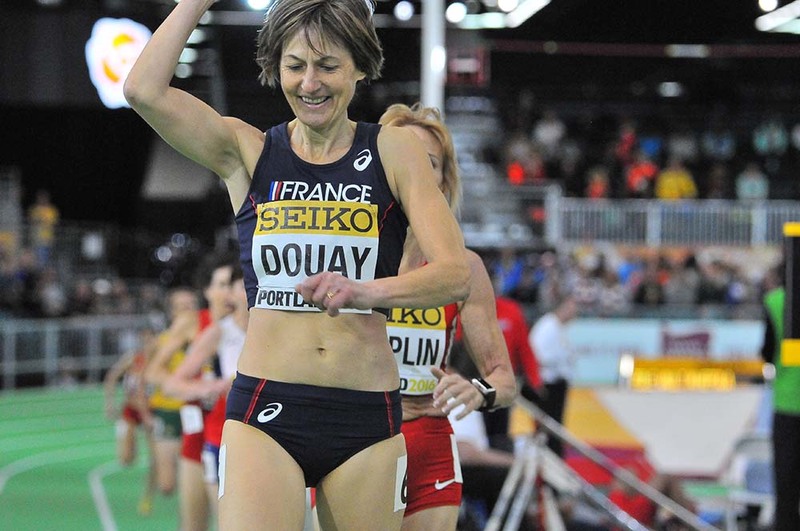 Helene Marie Douay of France celebrates winning the W55 race in 2:37.30. Thanks Ken, I could always use some great images for my Blog. As always, I will give credit where credit is due! Thanks Ken for your work and contribution for the Masters track&f. That’s exactly what I do with my pictures in Peruvian Masters Athletics everytime I have a chance to be in a Championship. Terrific photos, Ken! Almost feels like I am right there! What a gift. Thanks. Wonderful shots! I’m glad to see the masters getting such well-deserved recognition and it looks like the crowd really enjoyed the races as well. Congrats to all the competitors and thank you Ken for sharing. Thanks Ken…Very generous of you.. Great shots!! Thank you for the generous use of your photos. Just to let you know that I will be using #DSC 5990, 6014,6046 and 6057 under your name in the May 2016 edition of the Waratah, which I edit. That’s the newsletter of New South Wales Masters Athletics.